Check out this marvelous two bedroom, two bathroom beachside condo that sleeps six at Inlet Reef, room 412. This spacious, nicely decorated condo has everything you need to ensure your vacation is a comfortable one. The open kitchen has a flat screen TV to watch the news while preparing breakfast, and all the full size appliances and all the pots, pans, plates, silverware, and dishware needed to prepare your favorite feast. There are two dining tables, one that sits four, and one that sits six, ensuring you’ll never be needing extra meal time seating. 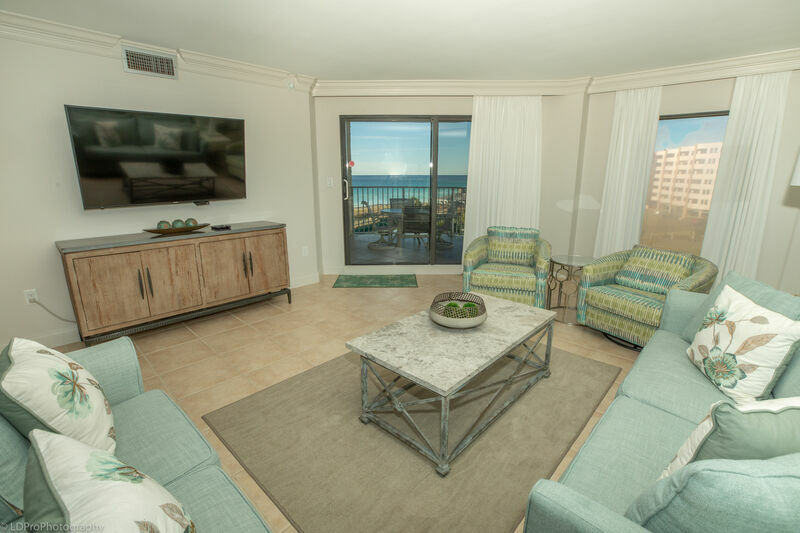 The Living Room has a love seat, a couch that doubles as a Queen Sofa Sleeper, a Large SMART TV, digital cable, a DVD player, and access to the balcony. he Guest Bedroom has two Twin Beds, a flat screen HDTV, and a DVD player. The Guest Bathroom has a bathtub/shower combination. The spacious hexagonal balcony has an outside dining table and seating, a wet bar, and spectacular views of the Gulf of Mexico. This condo also comes with complimentary Wi-Fi internet access, and a full size washer and dryer. Comes with FREE BEACH SERVICE during season! Two beach chairs and one umbrella. We stayed at Inlet Reef, unit 412. It was great, very clean and seemed larger than most 2 br condos we have stayed in. Would definitely stay here again. The area is perfect, Holiday Isle is a bit quieter and less traffic than the places right on 98. First, let me say we spent most of the time at the beach or at the pool. However, for the time spent at the condo, it was amazing! Sure, the balcony wasn't huge, but you have to understand that for a small family like ours, it was perfect. The view was pleasantly peaceful. We enjoyed sitting out there watching the sunrise and sunset, as well as the tides. The condo was clean, well-stocked, and had a homely feel. But or favorite part were the beds. You would have the best rest possible, that going to sleep late or waking up early wouldn't be a chore. We would definitely go back, especially if we got the same place. A wonderful and comfortable condo! Clean and nicely decorated. Kitchen was well stocked with any cooking utensil needed. The balcony was a bit small but adequate for a table and a lounge chair. The beach view was at a slant but you could easily see it and enjoy the beach view. The Holiday Isle app was a nice techy touch and helped keep us up to date on our rental. We had such a great time and really enjoyed the condo. It had plenty of space for our family and it was very nice and clean. It exceeded our expectations. We hope to be back in the future.